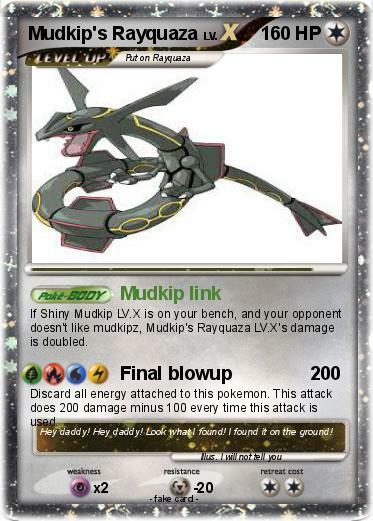 If Shiny Mudkip LV.X is on your bench, and your opponent doesn't like mudkipz, Mudkip's Rayquaza LV.X's damage is doubled. Discard all energy attached to this pokemon. This attack does 200 damage minus 100 every time this attack is used. Comments : Hey daddy! Hey daddy! Look what I found! I found it on the ground!